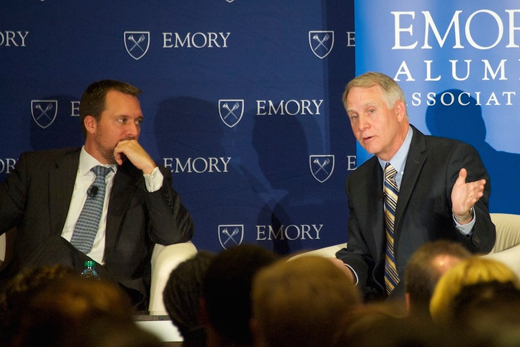 Emory University President James Wagner (right) examined the university's roles and responsibilities in a public conversation with Emory Alumni Board president Doug Shipman, CEO of Atlanta’s new Center for Civil and Human Rights. Photo by Tom Brodnax. Both Emory University and Atlanta's new Center for Civil and Human Rights have the potential and the responsibility to use their local ties to impact issues around the world, leaders agreed at a recent conversation hosted by the Emory Alumni Association. Emory President James Wagner and Center CEO Doug Shipman 95C, president of the Emory Alumni Board, addressed challenging questions Sept. 4 for "Local Roots to Global Impact," a sold-out conversation at the Center for Civil and Human Rights, which opened this summer with strong Emory ties. "From Washington politics to Wall Street to Tibet to Bolivia, Emory is really making a difference across the globe through alumni, and faculty research, and partnerships," said Crystal Edmonson 95C, broadcast editor for the Atlanta Business Chronicle and moderator of the event. The Emory Alumni Association organized the discussion for 200 alumni and guests who also had the opportunity to tour the Center, which uses interactive exhibits to encourage attendees to connect the lessons of the American Civil Rights Movement to human rights struggles around the world. Emory Alumni Board Secretary Chi Chi Okezie 98Ox 00C opened the evening by observing, "It is fitting that we are here tonight in a center that represents … the magnificent tribute of individual differences as well as shared cultures that make our nation so great. "The Center for Civil and Human Rights is a landmark institution," she said, "a time capsule where we can revisit memories, we can also reflect on moments that we can collectively grieve, as well as celebrate in triumphs over and over again." During the conversation, Shipman discussed how the Center defines civil rights and human rights. "From our perspective as a center, civil rights are rights you have because you are a citizen or you have some relationship to the law in a certain geography," Shipman explained. "Civil rights are those that are defined by law. Human rights are those that transcend citizenship or geography. They can transcend law or they can be protected by law. "Civil rights in some sense is a subset of human rights simply because human rights is a much broader kind of thing, and really human rights in the modern sense were designed to be with you no matter where you were as long as you're alive," he continued. "Because you're breathing you get certain human rights." Wagner expanded Shipman's definition. "Human rights derive from being human. To act on those, to aspire fully to enjoy those, means to help others and help yourself be what it means to be fully human. It may be that we have not yet unveiled all of those human rights that need to be articulated and pursued." The evening was designed to explore the role Emory and the Center will play in the shaping of Atlanta's future and the impact these civically engaged institutions can have as conveners of key conversations and supporters of civil and human rights. As the conversation unfolded, Edmonson referred to Atlanta's strong civil rights history and asked, "How does Emory take that local history and use it to inform where the university is poised to go?" Wagner reflected on what it means to be in Atlanta when one has a global mission. "What a gift it is to be in Atlanta," he said. The city is "quite a global crossroads, and that is increasing. With the illustration of what has happened, the illustration of having been a center for civil rights activity, of what can be done by people rightly motivated. It's just a wonderful gift." Wagner added that it is "no longer difficult for universities to ask students to imagine what it means to be a global citizen." He referred to "a generation of young people who grew up internet connected, who do not anticipate that what they are probing will stop at some border." Instead, he said, that intellectual curiosity "will go everywhere." Not all conversations about civil and human rights will be comfortable, Edmonson noted. "How do we create a safe environment, whether at Emory or the Center, but a safe environment to have some of the difficult conversations that come up surrounding human rights and civil rights, and come up with workable solutions?" she asked. "That always is the question of humanity," Shipman responded. "Start with the basic fact that every human rights atrocity that has ever happened depends on the dehumanization of a group." However, he suggested, "If you flip that equation, the way to have good conversations, and authentic conversations, is to build greater human empathy further away from yourself." Through interactive exhibits that use visualization and sound, "At the Center we try to create a connection between a visitor — no matter who they are — with somebody who is further and further away from who they are, someone of another gender, someone of another religion, someone of another race, someone of another nationality, someone of another age," Shipman said. "The further you can draw that circle and say that's still 'we' and 'us' and not 'them' and 'those people,' you can then have a conversation because at least if I think you're human, and I think we have something in common and even if I disagree, I'm not going to go violent, and basically kick you out of the group and the conversation," he said. Shipman concluded that the process involves "taking that premise and the logical steps that follow from it, and creating emotional connectivity between individuals." On the university level, Wagner noted that "universities are about ideas. We are about knowledge, creating, preserving, applying and teaching knowledge." He suggested, "In addition to what you provide the platform for, there needs to be disciplines, exercises where we can demonstrate where people with violently opposed views can engage non-violently. That is the university's responsibility, and we have more and more programs that encourage this." Nigerian-born Diogo Anyigbo 10C 15M 15PH closed the evening with a personal story of her journey to Emory. "Education has and continues to be one of the most important human rights issues of our time. It is the biggest determinant of one's social mobility," she said, citing her own rise from a lower socioeconomic status to a secure future as a pediatrician. "Programs like these make me so proud to have chosen Emory for my education." For more insight on "Local Roots to Global Impact," please watch the video of the program.